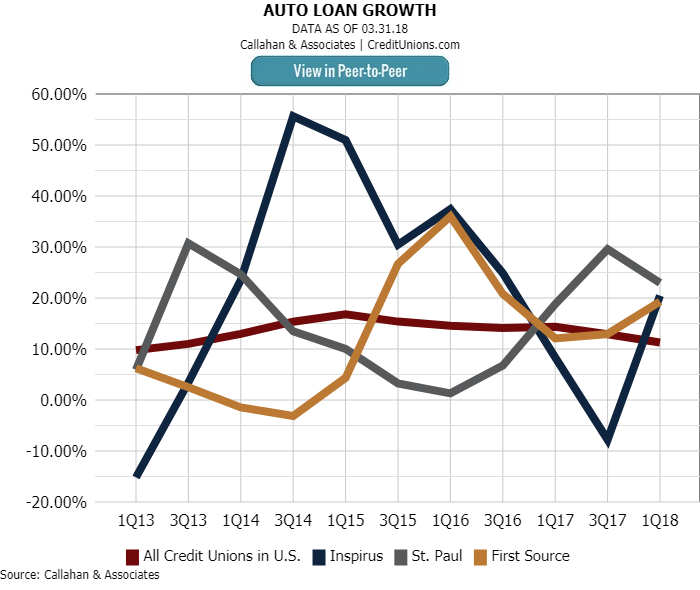 Inspirus, St. Paul, and First Source credit unions all posted auto loan growth sharply higher than the first quarter national average. Flexibility and efficiency helps these credit unions lend more and deepen member relationships. Since the creation of the American credit union movement more than 100 years ago, this country’s financial cooperatives have provided member-owners with the most favorable credit terms possible — blending core values with loan-to-values and other measures to respond to a changing landscape. Direct lending remains the lifeblood of many credit unions, and doing it well is a cultural and business imperative. Here, three credit unions offer their insight into how they succeed in the one-on-one auto lending space. Inspirus, St. Paul, and First Source credit unions all posted auto loan growth sharply higher than the national average of 11.27% in the first quarter of 2018. What First Source does have is a program that has approved 3,147 vehicle loans totaling nearly $50 million from its launch in July 2015 through May 2018. The consultative nature of its approach to cross-selling has resulted in another $9 million in other loan types and more than $4 million in new deposit balances, DeMetri says. Meanwhile, the success of the direct lending program led to the creation of the credit union's separate Lifestyle Loan Program that offers unsecured loans for funeral expenses, pet care, home improvements, holidays, and health improvement, among other needs. Budgeting, college and retirement planning, and debt consolidation also are part of the program. The direct lending department began with two lenders who relied on the cooperative’s central underwriting staff. Now, the department includes a supervisor plus three lenders as well as a phone system that routes calls to the lifestyle lending team. The department also has its own underwriter, who works under the supervision of the lending manager in the call center. Dealers can refer potential borrowers to First Source but do not take applications or make calls on decisioning, pricing, or closing loans. According to DeMetri, this helps the credit union retain personal contact with its borrowers. It also helps First Source retain firm control of the program. Are your auto lending strategies working? It takes minutes to compare various aspects of your auto lending portfolio to other credit unions with Peer-to-Peer. Compare against credit unions in your state, asset range, or by business model. The credit union monitors culture via in-person visits as well as educational breakfasts and luncheons, plus phone and email communications. It also monitors interactions between the direct auto lending team and a dealer’s staff. It seems to work. Direct auto loan growth was 2.9% year-over-year in the first quarter of 2018, boosting that industry portfolio to $140.2 billion. St. Paul Federal Credit Union ($173.8M, St. Paul, MN) reported first quarter growth of 22.99% in its auto lending channel — with 100% of that growth attributed to direct lending. What St. Paul FCU does foster is flexibility. The credit union allows its lenders to look at a member’s specific situation and determine what would make a deal work; for example, going up to 130% LTV for a creditable borrower upside down in a loan. The credit union also offers debit account rates that can go as high as 4.99%, depending on use, and brings in loans via targeted email and snail mail campaigns. Credit unions held $140.2 billion in direct loans on their books at the end of the first quarter of 2018. To up your lending game, try one of these practices embraced by the credit unions profiled here. Make sure the credit union’s rates and terms are competitive. Give proven lenders the flexibility to match rates and other conditions, such as LTV. Use technology to make the process fast and efficient. Online applications and instant decisions are good places to start. Communicate with members about how to buy a car, including what they can expect at the dealership. Train staff members about the credit union’s products and member-first philosophy, which includes listening to members. Set goals and create dashboards to monitor progress and pitfalls. “Instead of sending 12,000 mailers to members, we send 1,200 to non-members who we’ve identified through credit bureaus as having vehicle loans that we can save them money on,” Petersen says. That kind of efficiency spreads across the operation, helping St. Paul FCU achieve top rankings among its asset-based peers in metrics such as as loan originations per employee and per member. Its efficiency ratio is 69.5%, compared with the 86.1% average its asset-based peer group reported in first quarter 2018. And in Callahan’s proprietary measure of member value, Return of the Member (ROM), the credit union currently has a score of 98.59% overall and 99.11% in Return to Borrowers. In 2012, Inspirus Credit Union ($1.3B, Seattle, WA) had a loan-to-share ratio of 42%. With the help of new management, that ratio is now 90.39%. “We’re in a constant state of pre-approval,” says senior vice president Doug Grout. The loan-to-share ratio at Inspirus Credit Union has steadily increased in the past five years. 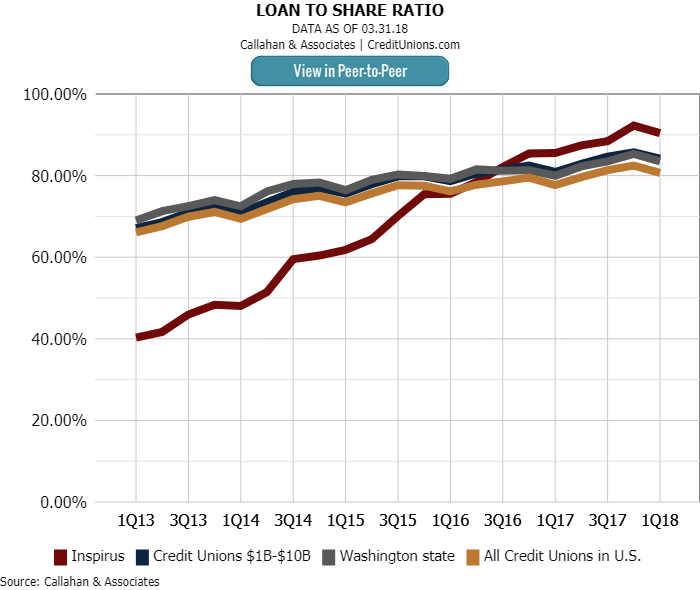 It hit 90.39% in the first quarter of 2018 and now exceeds its asset-based peer group as well as all credit unions in Washington state and the country. 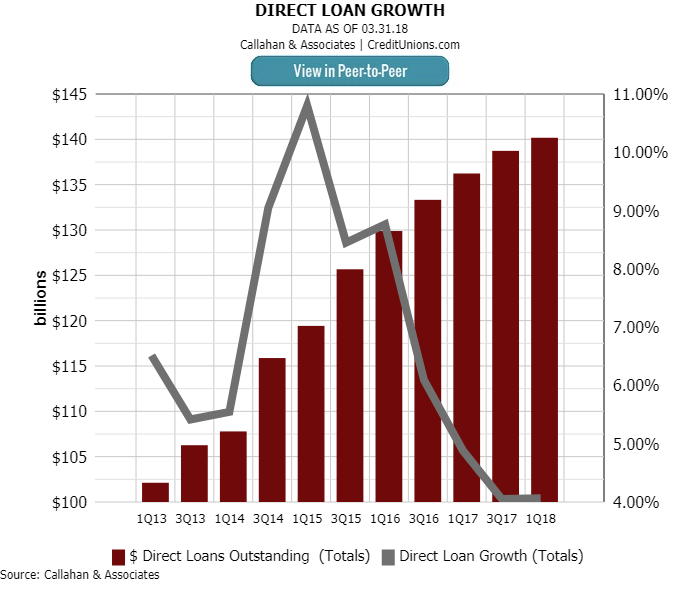 The credit union reported a 20.49% year-over-year gain in direct lending in the first quarter of 2018. It got there, partly, through its ongoing evaluation of member profiles to get to members before they need a loan and let them know that they’re approved. The lending balance sheet also has been bolstered by loan participations. Inspirus is a former teachers credit union and the organization still has deep relationships with that community, bolstered by the credit union’s volunteer time in schools and donation of up to 5% of its income for classroom supplies and more. But Grout says the credit union’s loan model is changing because of the challenges to growing organic loans quick enough. Inspirus has now become an indirect lender with a twist. It focuses on borrowers with credit scores of 680 or lower, those in the B-C-D tiers. And its new indirect lending program generated $1 million in its first month.